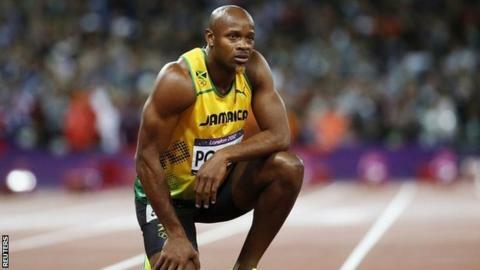 Former world 100m record holder Asafa Powell has received an 18-month ban for failing a drugs test. The Jamaican sprinter, 31, took the banned stimulant oxilofrine at last year's national championships but the suspension has been backdated and will end on 20 December, 2014. Powell called the ruling "unfair and unjust", and said a legal supplement he took, Epiphany D1, was contaminated. He plans to appeal to the Court of Arbitration for Sport. Simpson, an Olympic 4x100m relay gold and silver medallist, is a training partner of Powell and took the same substance at the same event. Another Jamaican, Olympic discus thrower Allison Randall, was also handed a two-year ban on Tuesday for using a prohibited diuretic. Powell and Simpson, who provided their samples on 21 June, 2013, will miss the Commonwealth Games in Glasgow in July. The three-member disciplinary panel that ruled on Powell said he had been "negligent". Powell, the biggest name in Jamaican sprinting before the rise of double world and Olympic champion Usain Bolt, missed last year's World Championships as a result of his failed test. In January, he testified that Canadian physical trainer Chris Xuereb provided him with nine supplements, including Epiphany D1. But Professor Wayne McLaughlin of Caribbean Toxicology told the Jamaican Anti-Doping Commission during Powell's trial that oxilofrine "does not improve speed"
Xuereb has denied providing performance-enhancing drugs. Prior to the verdict and in the wake of the Veronica Campbell-Brown case, Powell's coach, Stephen Francis, called on the Jamaican Prime Minister to disband the country's anti-doping organisation and sub-contract the testing procedures to a credible overseas testing agency. Earlier this year, the Court of Arbitration for Sport cleared Campbell-Brown, a two-time Olympic 200m champion, of a doping violation. Francis said: "After the Veronica Campbell incident, after the whole issue of not testing people, I think we need to get rid of these people. "They need to sub-contract it to England or Germany or whoever it is who can carry it out properly because obviously we in Jamaica can't do this thing properly. It is embarrassment after embarrassment after embarrassment." IAAF spokesman Chris Turner said there would be no comment from athletics' world governing body while the case was still open.